Terrorize the bowlers with your big-hitting skills during the Power-Play overs, in this exciting, realistic and feature packed cricket game! Choice of teams, customizable and easy-to-play interface options, separate practice mode, global leaderboards and immersive graphics make Cricket Power-Play a must have game for every Cricket fan on iOS. 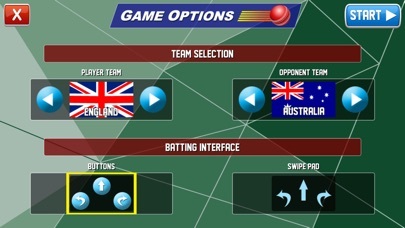 Interface options - A choice of conventional control buttons as well as option to "swipe" your batting shots. These controls can be positioned on either side of the screen depending on your preference for a left-handed or right-handed layout. Team flags - Choose your team and the opponents from a list of the top cricketing nations of the world. Game Center leaderboards allow you to compare your high scores, team-wise, with players all over the world. This is the paid version of the Cricket Power-Play Lite game, and has 15 overs of match-play, with 10 wickets in hand. Check out the game's support page using the link below to learn more about using the controls of the game.